I made this cheesecake for the 4th of July this year. It was a fun way to help celebrate our most American of holidays while living in Ireland for the summer. You can top this cheesecake any way you like or is also delicious plain. I topped with fresh strawberries, blueberries and shaved white chocolate for our festive holiday celebration. The recipe is from All Recipes. * I could not find Graham Crackers here in Ireland so used half a sleeve of Tea Biscuits. Perfect substitution. Preheat oven to 350. Lightly grease bottom and sides of 9" springform pan. 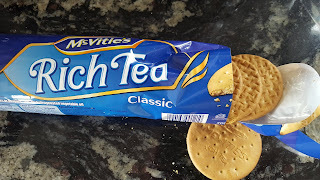 I used my hands to crush the Rich Tea Biscuits. Mix Biscuits (or Graham Crackers) with 3 Tbsp. melted butter until evenly moistened. Press the buttered crumb mixture into bottom and 1/2 inch up the sides of springform pan. Put in fridge to chill while making the filling. Whisk flour into the creme fraiche or sour cream. Add vanilla. 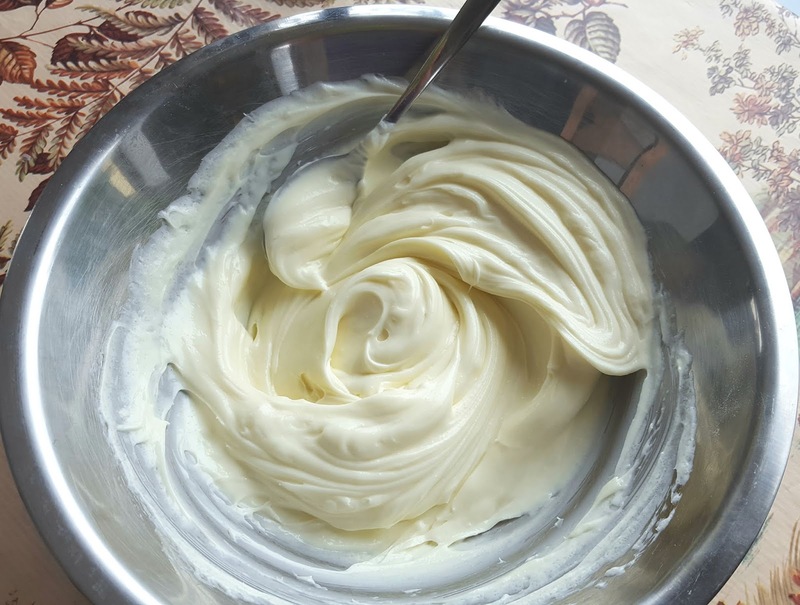 Whisk in cream cheese, 8 oz. at a time. Add sugar and whisk until thoroughly combined (3 - 5 minutes) and shiny. I am sure you could do this with either a hand or standing mixer, but I have neither here in Spiddal so the whisk worked well and also provided some good upper body exercise! Whisk in eggs, one at a time, mixing well after each addition. Stir in lemon and orange zest. Gently spoon filling into pan. Bake in preheated oven until edges are nicely puffed and the surface of the cheesecake is firm except for a small spot in the center that will jiggle when pan is gently shaken. This will take about 1 hour. When done, turn off oven and leave cheesecake in oven to cool for about 1 hour. This prevents cracking. 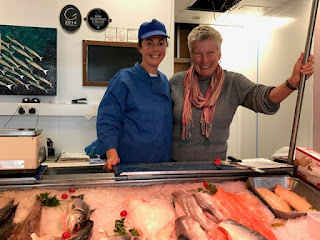 I learned another neat way to prevent cracking from Chef Jane St. Pierre at the cooking class I went to with my brother at Stonewall Kitchen in York, Maine. Jane says check the cheesecake temperature just before you think it's done. Insert thermometer in the center of the cake. If it registers 160 degrees, it's done! No cracks! Cool completely before topping. 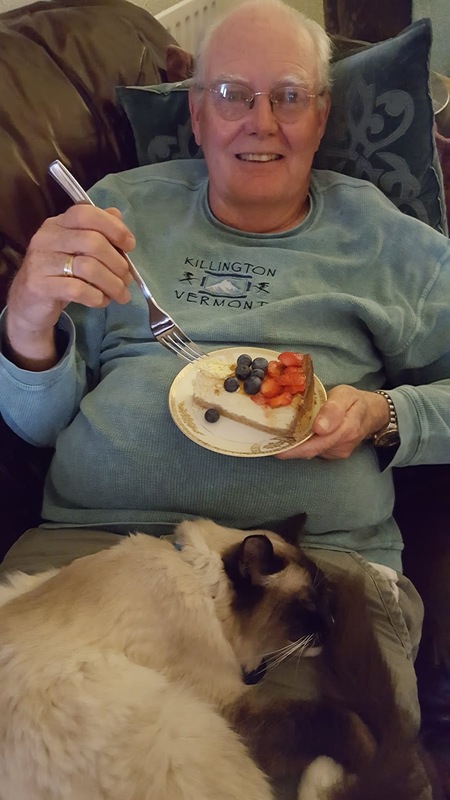 My husband, Jerry, is in cheesecake heaven. Our cat, JoJo, is happy to nap through it. 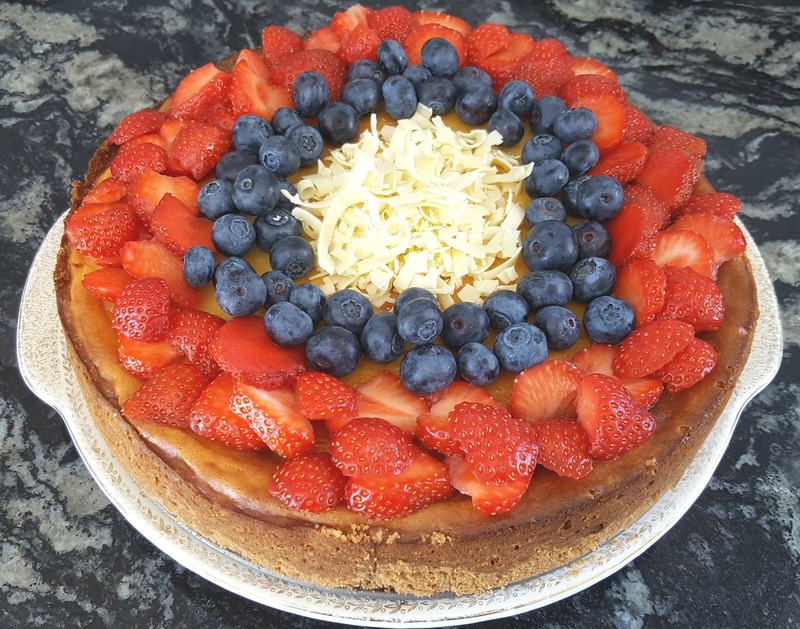 I made this cheesecake again when our good friends Brendan and Mary O'Tuairisg came to dinner with their ever so cool daughter, Roisin. Our son, Mike was here visiting, too, which made for a very festive night! 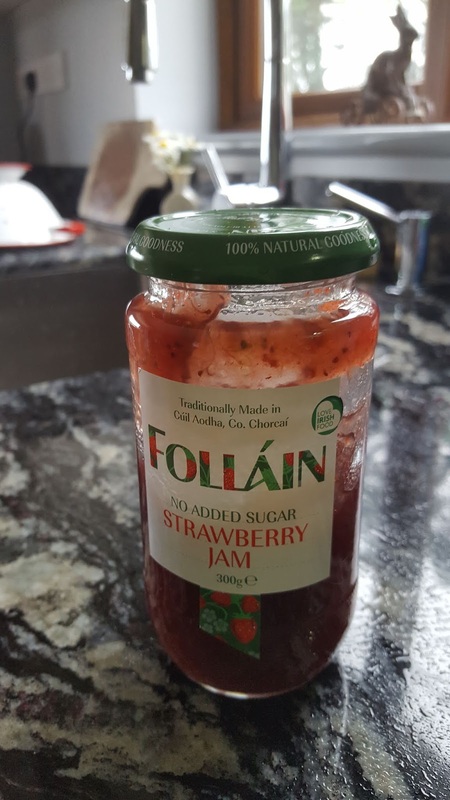 This time I made a strawberry topping by combining 2 cups of freshly sliced strawberries with a cup of Follain's Strawberry Jam. 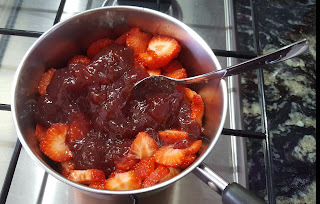 Gently heat the jam and stir in the sliced strawberries. The berries do not need to cook, but get them warm enough so they release some of their beautiful juices to make a rich strawberry sauce. Let cool completely before topping the cake. Let the cake cool completely before topping, as well. 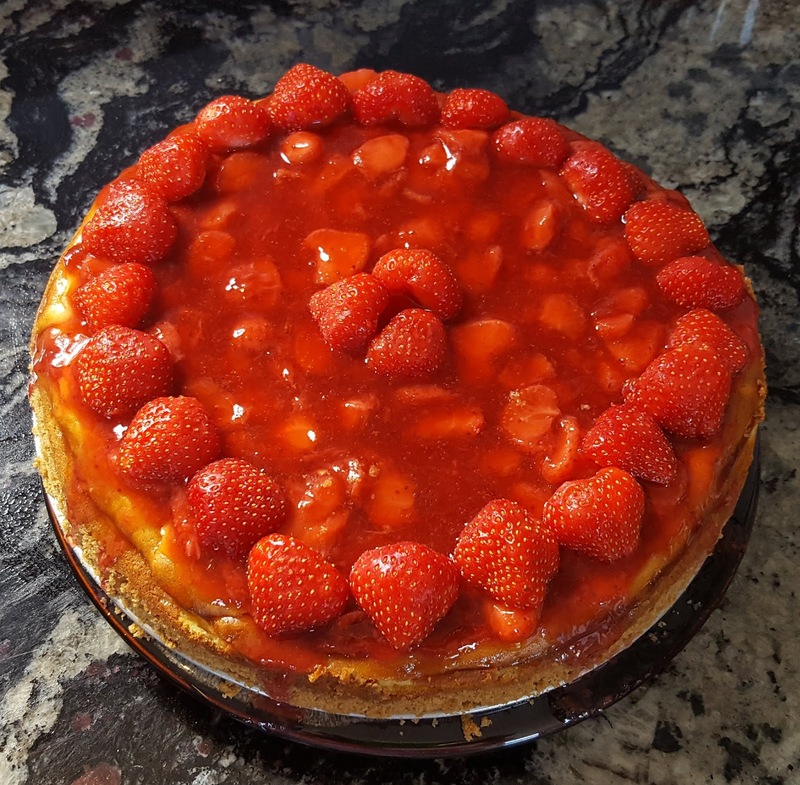 I LOVE CHEESECAKE AND IF YOU FLIP THROUGH PREVIOUS BLOGS YOU'LL SEE I MAKE A LOT OF IT! ALL FOR TODAY. OUR TIME IN IRELAND IS NEARING AN END, BUT WE'LL BE BACK AGAIN SOON TO CELEBRATE MORE OF THE CHARMING IRISH WAYS. 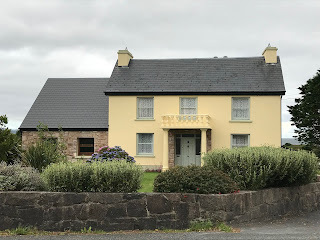 This is our Irish home sweet home! There was a time, not that long ago, when you couldn't give Monkfish away. 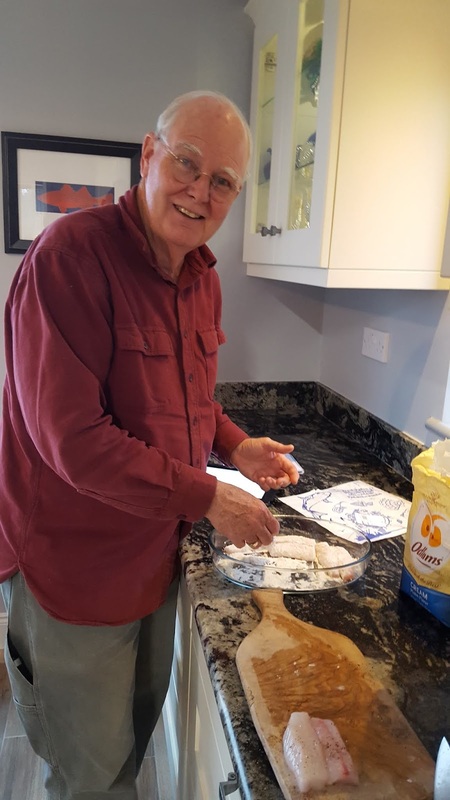 Sometimes called, "Poor man's lobster", now it fetches a premium price and is enjoyed for its sweet taste and pleasing firm, meaty texture, similar to lobster and scallops. Monkfish is all head and beautifully designed with a huge mouth perfect for catching prey. They live on the ocean bottom, in both the Pacific and Atlantic and some believe got their name from their remote and solitary existence in the ocean's depths. I think that's a bit of a stretch. A more plausable explanation for the name, monkfish, is that monks used to go to the docks asking for fish. Monkfish, because of its ugliness was not marketable, and fisherman would give them this by-product. Although they are also known by several other odd names: Goose-fish; Sea-devil; All-mouth; and Fishing-frog. 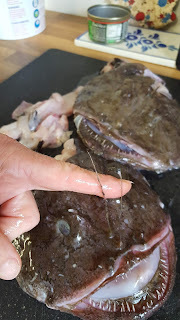 Their Latin name is Lophius Americanus and the European variety is L. Piscatorius, caught right off our shores in Galway Bay. They are not a pretty fish and their most distinctive feature is their large mouth. They also have an interesting, irregular growth of flesh in the front of their head, just above their mouth. The esca, also referred to as the illicium, is movable in all directions and used as a lure to attract other small fish into their massive jaws. The "antenna" dip down resembling a shrimp and the prey is snatched. Nature! Love it! 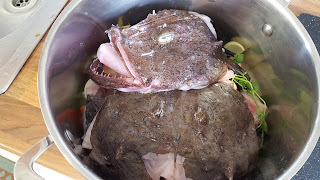 The tail is the portion of monkfish that is eaten, but the head has lots of "meat", too and makes an incredible fish stock for seafood chowder. Once boiled, pick off the "meat" and make a luscious seafood salad. Now, on to MONKFISH MARSALA! This recipe is from The Daily Catch in Boston, across from what used to be the famous Jimmy's Harborside. *I couldn't find Marsala wine so used sherry instead. Not a bad substitute, but it's best to use Marsala. 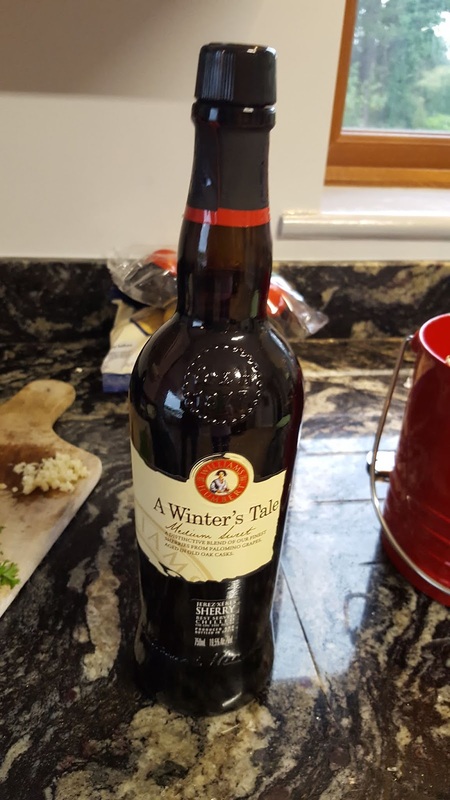 This was excellent sherry, but really not the same as Marsala. **The recipe doesn't call for the addition of fish stock, but my husband, Jerry, used to eat at the Daily Catch weekly and became quite friendly with the chef. He said add 1/2 cup fish stock to deepen the flavor. I had made mussels the day before so used that. seasoned flour. Shake off the excess. Place a large skillet with oil over medium high heat. I added a tbsp. Of butter to the pan, as well. It helps brown the fish and adds to the flavor. 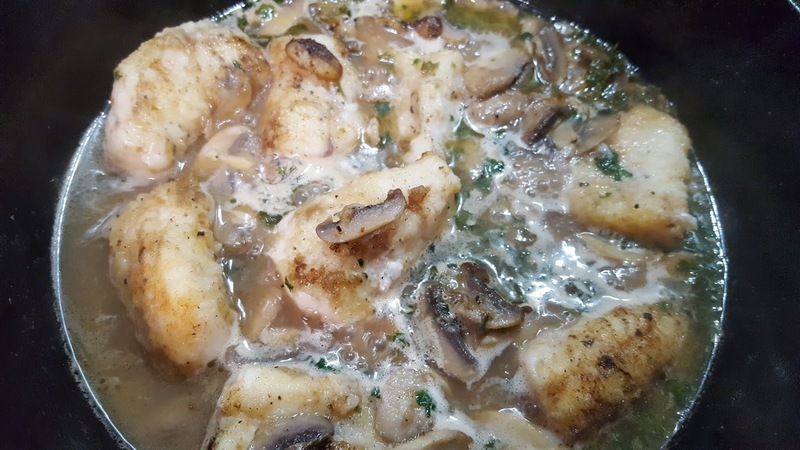 Sear the monkfish in hot pan for about 2 minutes per side or until nicely browned and slightly carmelized. Remove the fish from the pan and set aside. Add the mushrooms and cook for a couple minutes until the butter/oil is absorbed and mushrooms start to look translucent. I was a little late on this photo as flames are nearly gone. does flare up and could take off your eyebrows! 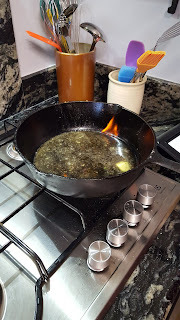 Remove pan from heat and add Marsala wine. Return to heat and ignite wine. Flambe until alcohol burns off. Flames will die down. 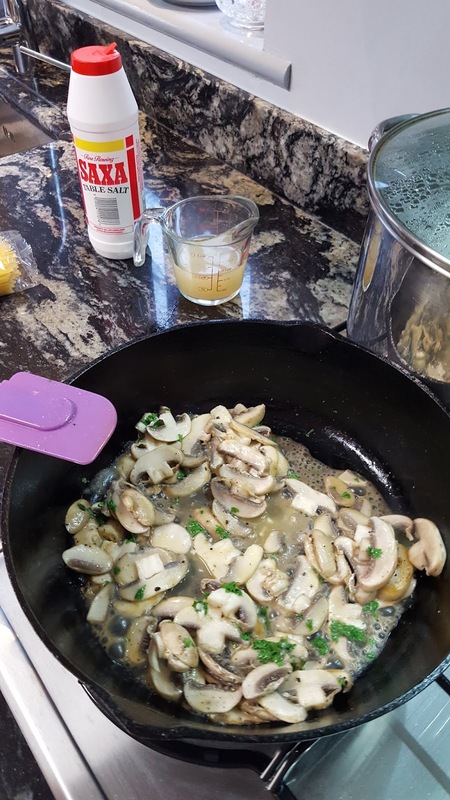 Add fish stock, if using, and squeeze lemon juice into pan. Makes sure you catch the seeds. Continue cooking on medium high until sauce is reduced; about 10-15 minutes. Return fish to pan. Add 1/2 Parsley, a little more butter and let bubble away on low heat for another 10 minutes. 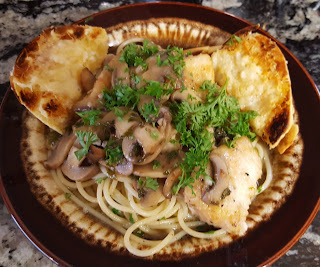 Serve over linguini topped with the last of the parsley. Garlic bread works well to soak up that sumptuous sauce! LIVING IN IRELAND. ITS A VERY SPECIAL TREAT! 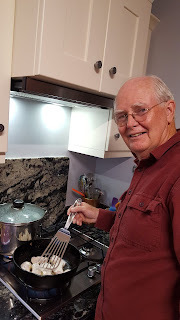 MY HUSBAND COOKS WITH ME!! 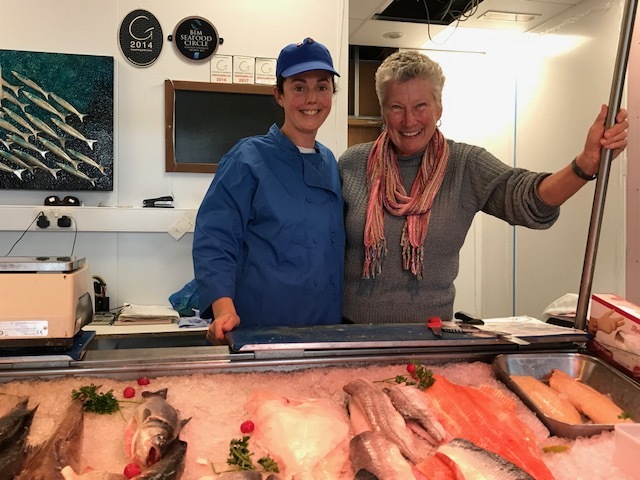 Connie Thornton from Ali's Fish Market in Barna knows her fish! ALL FOR TODAY, BUT TUNE IN AGAIN SOON, AS MORE GOODIES AHEAD.